Cochinillo asado, or roast suckling pig, is one of the most typical dishes in the cuisine of Castilla, Spain, especially in the city of Segovia. Chefs take pride in the tenderness of their roast pigs and prove how delicate the meat is by cutting the pig with a plate instead of a knife. 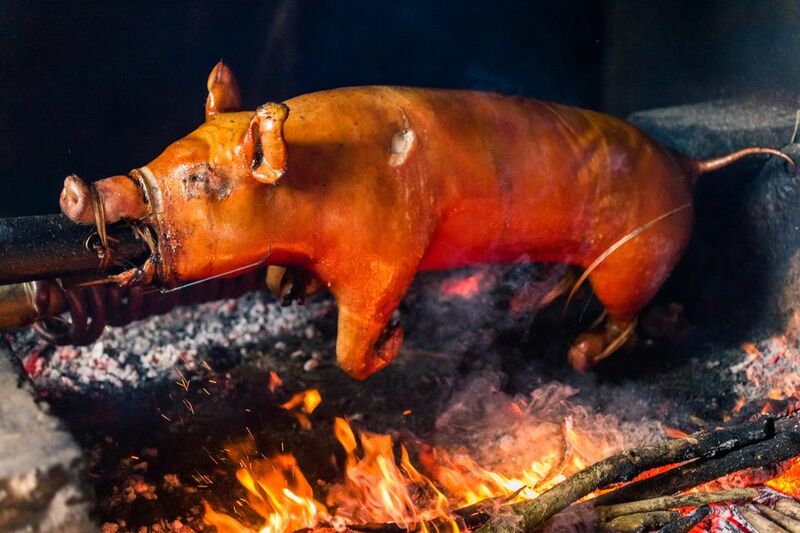 The technique is the same as roasting any other kind of meat, and a suckling pig is an ideal centerpiece for a traditional Spanish meal that will impress your guests. Suckling pigs are much smaller than the pigs we are familiar with that are roasted on an outdoor spit. They are about one-third the size and may be difficult to find in the United States, but it is worth the search, and if you ask your butcher they will most likely be able to get you one. This recipe calls for Spanish olive oil, which has a fruitier taste than Italian olive oil, but if you can't find the Spanish version try to find an Italian oil that is described as "fruity." Season the piglet with salt and pepper, inside and out. Wrap the ears with aluminum foil to prevent them from burning. Place the piglet in a large, open roasting pan. Coat with olive oil and place dabs of butter all over. Place in oven and roast, basting often with the pan drippings, for about 2 1/2 hours. While the piglet is roasting, peel the carrots and the onion. Slice the carrots into 4 pieces each and coarsely chop the onion. About 10 minutes before removing the piglet from the oven, place the carrots and onion in the pan with the piglet. Remove the piglet from oven when it is fully cooked. Remove the aluminum foil from ears and place piglet on a serving dish. Keep warm in a warming drawer or in the oven on the lowest setting. Pour juices from the roasting pan into a saucepan, add the vegetables, and heat over medium heat on the stovetop. When the juices start to sizzle, skim the fat off the top. Add 2 cups of water. Increase heat to high and boil rapidly to thicken. Strain through a strainer or cheesecloth into a gravy boat or small bowl. Serve the piglet on a large platter with the warm gravy on the side, and roasted or fried potatoes and a simple green salad.